Based on oral traditions, folktale story books can translate really well to audio recordings and I want to talk about a couple that I think are particularly well done. 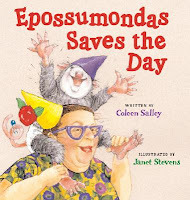 In this retelling of Sody Saleratus, it's Epossumondas's birthday. While preparing for his party, Mama discovers she's out of sody saleratus (baking soda) and sends Baby Gator to go get some more. Well, on the way back from the store, Baby Gator meets the great, huge, ugly Louisiana snapping turtle who swallows him up in one big gulp. When both Auntie and Mama also fail to return from the store, Epossumondas decides to take matters into his own hands. Salley's story and narration are laugh-out-loud funny and I actually listened to it twice in a row because it was so good. This one is a great choice for family listening because I think it'll am use kids and adults both. 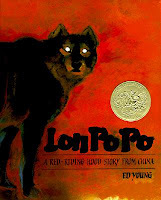 On the other end of the spectrum, Ed Young's Lon Po Po, a Chinese Little Red Riding Hood, has a much darker tone. When mother leaves to visit grandmother, she warns her three children not to let anyone in. But when a wolf claims to be their grandmother (their Po Po), they let the wolf in and then have to outsmart him to save their lives. Music and sound effects give the story an extra sparkle and the wolf's echoey voice is especially creepy. Of course, I wouldn't expect anything less from Weston Woods!